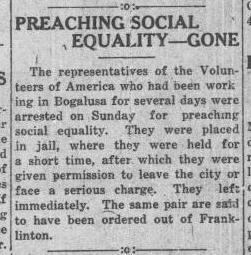 The Volunteers of America have been removed from Bogalusa, LA for preaching social equality. They were offered jail time or permission to leave. They chose to leave as they had from Franklinton. The war tax on automobiles has been settled, $30 on a Nash and $40 on a Studebaker. Prohibition is enacted as of July 1, 1919 as a war measure. Source: “Preaching Social Equality - Gone,” Boguluas Enterprise, Bogalusa, Louisiana, September 26, 1918. Page 1, Column 5.